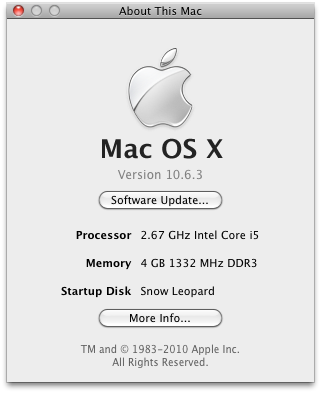 Today Apple released 10.6.3, the 3rd major update to Mac OS X Snow Leopard. 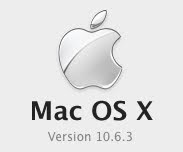 To update from 10.6.2, simply run Software Update or download the 10.6.3 Delta Update from Apple. If you're doing a fresh install, you can download the 10.6.3 Combo Update from Apple, which bundles the 10.6.1 and 10.6.2 updates, making it possible to go straight from 10.6 to 10.6.3. When you install a point update, know that it will erase and update some of your kexts in System/Library/Extensions. This can render components inoperative- especially when Apple modifies their graphics kexts. 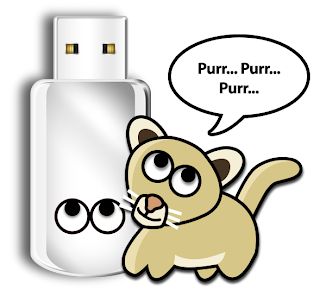 Remember to do a full backup of your data before running the update- you never know what will happen. Also do a full backup of your /Extra folder and your /System/Library/Extensions folder before installing the update. You may need some of those kexts, especially if you have made changes to device ids, modified AppleHDA.kext, etc... To back up, simply drag your /System/Library/Extensions folder to desktop, and rename the folder 10.6.2 System-Library-Extensions, or whatever will reference it best for you. If you're worried about borking your install, don't feel like you have to update right away- wait a week and see if it breaks anything. If I hear of any updates or workarounds needed for graphics, ethernet, sound, or any other component, I will add them to this post. Please post your results with the update in the forum! It will help others with similar hardware! See you in 10.6.3! 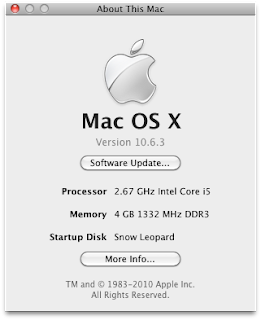 Still says Intel Quad-Core Xeon for i5/i7 by default. However, you can inject i5/i7 info into About this Mac by inserting SMcputype into smbios.plist. This functionality is included in the latest MultiBeast. For i5, use 1537. For i7, use 1793 . Thanks to Lightspeed and zoleg! Some users are reporting lack of USB support upon update to 10.6.3. In order to be 100% functional, USB needs DTGP + UHCI/EHCI fix applied in a modified DSDT. Otherwise USB keyboard/mouse will not work. If you do not have a DSDT, you may end up with no USB keyboard/mouse support. If waking from sleep with current DSDT edits and 10.6.3 IOUSBFamily.kext, you will have to re-plug any devices that require power. There is no official fix besides rolling back to 10.6.2 for now. We're working on new DSDT edits that will solve this issue. UPDATE: Use the Power Button on your case to wake from sleep instead of USB. There will be no USB issues, and even better, you do not have to change the IOUSBFamily.kext. 10.6.2 IOUSBFamily.kext Rollback will alleviate all issues, including trouble with iPhone/iPod Touch syncing. USBFamilyMOD 9.9.9 is now included in the latest MultiBeast. This allows full USB support without DSDT with the exception of syncing iPhone/iPod touch. New USB Fixes are in MultiBeast. The 10.6.3 update will break the current audio solution for LegacyHDA + DSDT for ALC 888/888b/889. The good news is that 889a is still supported- you can use the same solution as before. Bad news is that we'll have to come up with a better solution for these 3 codecs. 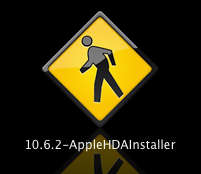 One less vanilla approach is to install the 10.6.2 AppleHDA.kext. Your system will work exactly as before. I've rolled up a package installer that will do the job automatically. This functionality is available in the latest MultiBeast.. Forget about LegacyHDA.kext and the DSDT edits and just use VoodooHDA.kext. It works fine with the 10.6.3 AppleHDA.kext in initial testing. Available in MultiBeast. You may notice that upon 10.6.3 and reboot, all of your SATA drives are orange, hot swappable, and show up as External. However, your drives will behave 100% normally. If you're bugged by this, you can install IOAHCIBlockStorageInjector or JMicronSATA in /Extra. Available in MultiBeast. Check out netkas.org for solutions and a new 10.6.3 QE/CI Exotic.pkg.